Orlando, getting your above ground liner installed for summer has never been easier. To aid you in tackling your backyard project we’ve added tons of helpful pool liner installer information. If you elect to be your own installer the information below will help you get through it. We have full details of the pool liner accessories you may need, installation instruction manuals as well as the best place to buy all of your pool items. If you decide to have us do the install, you’ll be glad to know our experience in building and repairing above ground pool liners in the Greater Orlando area runs deep. To help you we have a list of what to expect from a professional pool installation as well as our professional pool liner installation cost sheet. Here are the basic steps taken to replace the average above ground pool liner. These steps assume the water is removed, decking and other obstructions out of the way and no metal repair or replacement. The steps listed below are no different for the homeowner or professional installer. Follow them for a successful pool liner change. First we do a visual assessment of the pool’s condition including the filter equipment. If everything checks out we remove the old pool liner and set it to the curb for pick up. We carefully inspect the interior of the pool wall for any rust damage, repairing the wall if needed. We then begin pool disassembly for the new liner replacement, this includes removing the skimmer box and return jets. Once disassembly is complete we address the pool floor, re-working the earth and removing rocks, roots etc. Then the pool floor is smoothed out and and cove reworked making it ready for the new pool liner. Nutgrass weed killer is appied followed by the installation of Armor Shield or Wall Foam if applicable. The new pool liner is installed and attached to the pool wall. Once the pool liner is secure, water is pumped into the pool removing all wrinkles from the sides and floor. Once about 6″ of water is in we begin to re-assemble the pool. If this is a self-install, wait until you have about 2 feet of water in the pool before installing the skimmer and return. The typical timeline for us to complete a pool liner replacement is 3-4 hours. This could be longer if the pool has a deep end or deep center swimming area. Our price schedule is for flat bottom pools only. For every pool we install there are a few things that we need to get the job done, and here is the short list. These same things would be needed to complete your own install if doing so. 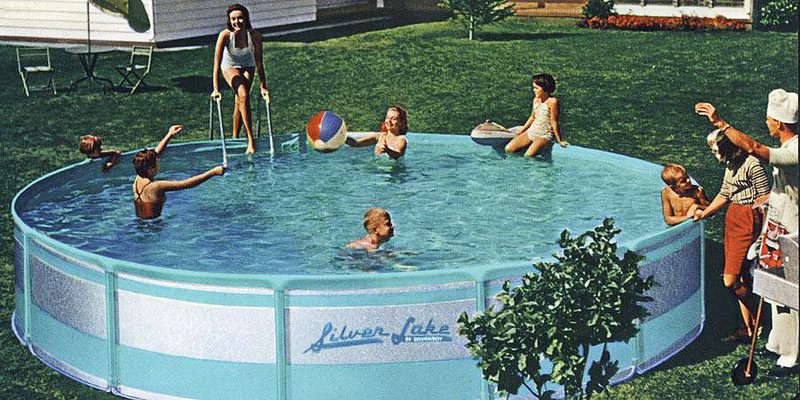 All of the pool components and accessories should be already be delivered and on-site before our crew arrives. We will need running water to remove the wrinkles from the pool liner. You will need water to complete the pool filling process. We may also need electricity to pump the water into the pool and test the filter system upon completion. After the installation of the pool is competed, you will have to continue filling the pool until full. Depending on pool size and water pressure this could take anywhere from 8–20 additional hours to fill. Once the pool is full it’s time to jump in and enjoy! This is an important section to read before setting out to install or have your above ground pool liner installed. Using the right accessories for your pool liner install can save time, money and aggravation. To help point you in the right direction we have a list below of common pool liner installation accessories. Some of these accessories are lifesavers for anyone building an above ground pool in the Orlando area while other are just great upgrades. But remember, Florida is home to moles and nutgrass and they are a real issue so Armor Shield pool floor pad and nutgrass killer are almost mandatory. Having to buy a new pool liner in a month because of nutgrass or a mole is an very expensive lesson to learn! Be sure to double check your pool size. This may sound ridiculous but it’s one of the most common mistakes people make. Nothing is worse than finding out you have the wrong parts when you are in the middle of your installation. I’m not going to spend a lot of time on explaining the differences between various pool dealers and what they offer for pools and accessories. Instead I’ll make this easy by just telling you the best place to go for everything you’ll need. Go to PoolsAboveGround.com to order you pool, liner or any accessories. They are an online pool supply house right here in Orlando and have been selling and installing above ground pools for several decades. They know what their talking about, sell only American brand pools and their pricing is great. They offer free shipping and can have your new pool or liner at your doorstep in a few days, and if there’s an issue they can sometimes resolve it as quickly as overnight. We installed over two hundred of their pools and liners last year around the Greater Orlando area and we are more than satisfied with the product quality and customer service they provide. And if you’re doing the install yourself you’ll really appreciate their live tech support. I really don’t know what more you could ask for. The pricing chart only represents some of the pool sizes on the market and should be used as a guideline only. If you do not see your size it’s likely somewhere in between the others and installation cost would be similar. If you have a deck, deep center, main drain or other features, this may increase the final price quote. If you are going to tackle the installation of your pool liner yourself, you are not alone. We believe that about 50% of all above ground pool liners are installed by the purchaser and not by a professional. And depending on your skill level, tool set, time schedule and willingness to take on the challenge, installing your own pool liner should take about a day. Less time for smaller pool sizes and maybe longer for large ovals and steep grades. To help make this easier for you we have included a list of basic tools needed along with some installation manuals for anyone installing a pool without instructions. This should be good for just about any make and model pool. If you still need help, give us a call or email. Thanks again for reading this and good luck with your project. If installing your own liner you’ll need some basic tools to get the job done. Below is a very basic short list of items needed, some jobs may require more. Razor Knife – used to cut out pool liner, cut opening for skimmer, return. Cordless Screwdriver – used to remove the majority of pool hardware. Various Screw-gun Bits – used for different fasteners on pool. Silicone – used on skimmer and return gaskets and hose fittings as needed. Square Point Shovel, Tine Rake, Concrete Rake – smoothing out pool bottom. Hammer, Pliers, Screw Drivers, Wrenches – disassembly and re-assembly of pool. Tape Measure – varification of pool size. Garden Hose – used to fill pool with water. Spray Paint – used to cover exposed metal surfaces on pool wall and parts.